The Legend of Samosir’s First Settlers | What an Amazing World! 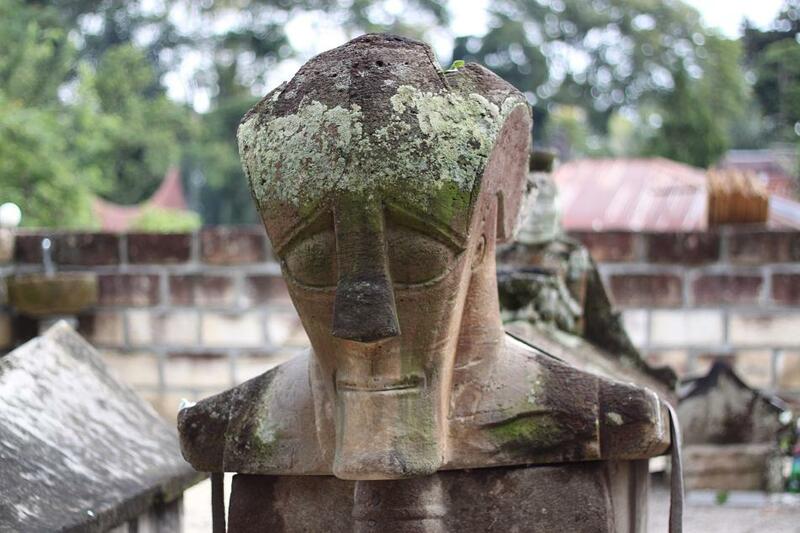 Legend has it that King Sidabutar was the first man ever set his foot on Samosir Island. Later on he and his descendants resides in an area which is now known as the small town of Tomok, 5 km south of Tuk Tuk. 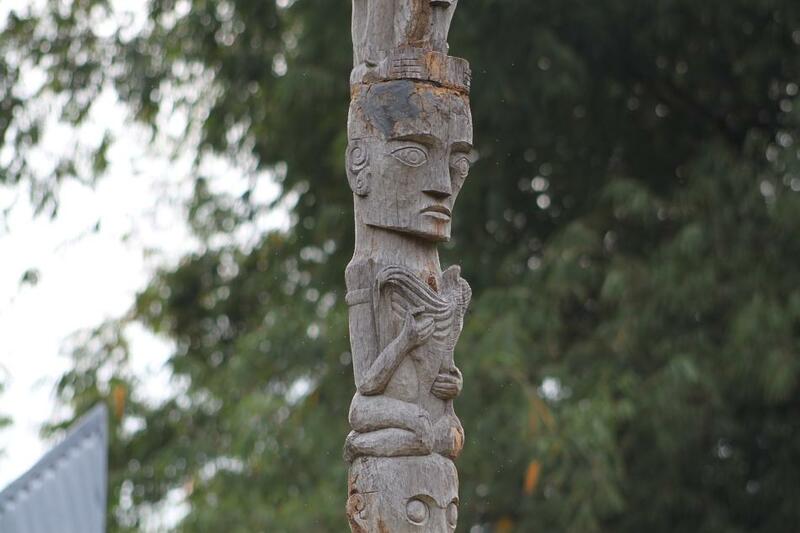 Before the arrival of Christianity to the island, they practiced an indigenous belief called Parmalim which is basically another form of animism. However, in the 19th century European missionaries successfully converted this society into Christianity, which occurred during the reign of the third king of Sidabutar family. 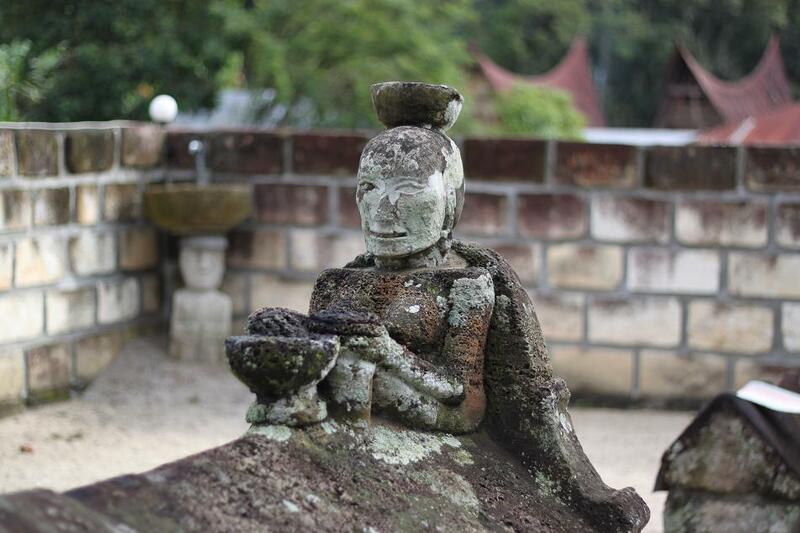 The royal graveyard at Tomok is the evidence to this. The grave itself is located a little uphill from the main road and we had to go through a small alley with souvenir stalls on both sides of it to get to the main site. 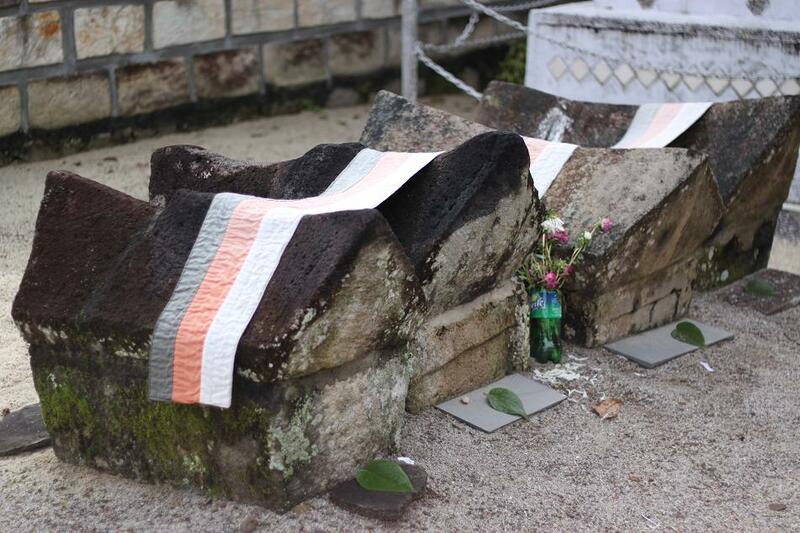 Prior to entering the grave, everyone is required to don a Batak traditional piece of cloth called ulos which is available at the gate and can be rented for free. Upon entering the gate to the grave, our eyes were fixated to one big tombstone with some carvings on it which resemble a face, a woman and a man. Apparently that is the tomb of the first King Sidabutar. The largest carving is said to be the face of the king himself, while the woman sitting on top of the tomb is the one the king had fallen in love for years. The other carving at the bottom of the tomb is said to be the king’s guardian. 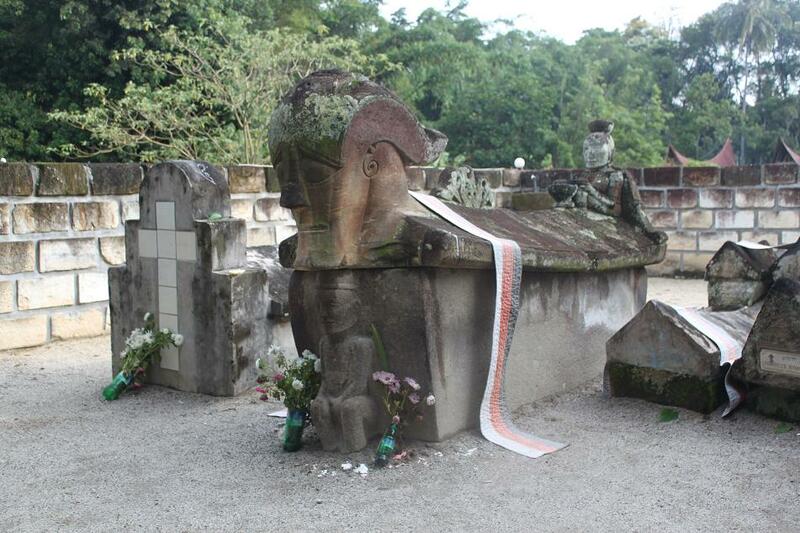 Apart from the main tombstone, there are other tombs in the area. Some adorned in Batak traditional ornaments while the others already had Christian crosses embellished on them. According to some sources it was not until the third king that Christianity became the religion of the family. Still in the same area, there are benches which are used for visitors to listen to the explanation from local guide. However since we came there quite early in the morning, there were barely any other visitors and we didn’t see any guide at all. Taking a little detour to the back of the main graveyard, we found some statues and a tall totem pole. 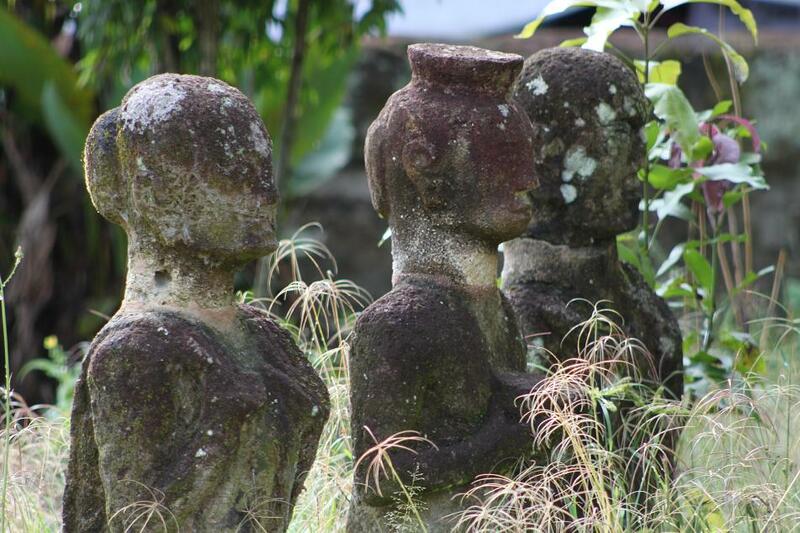 My best guess is they were made to symbolize the family’s respect to their ancestors. After strolling around this rather small compound, we continued our motorbike ride 10 km due north to visit the once cannibalistic society of Samosir Island. Pingback: Lake Toba: Nature’s Wrath Turned Into Eden « What an Amazing World! I love how the smaller tombs resemble Batak houses. It sounds like Samosir was first settled maybe a couple hundred years ago – which is not that old considering Indonesia’s long history! I know, it’s quite confusing actually as they must had come to Sumatra before the other Mongolian tribes came. 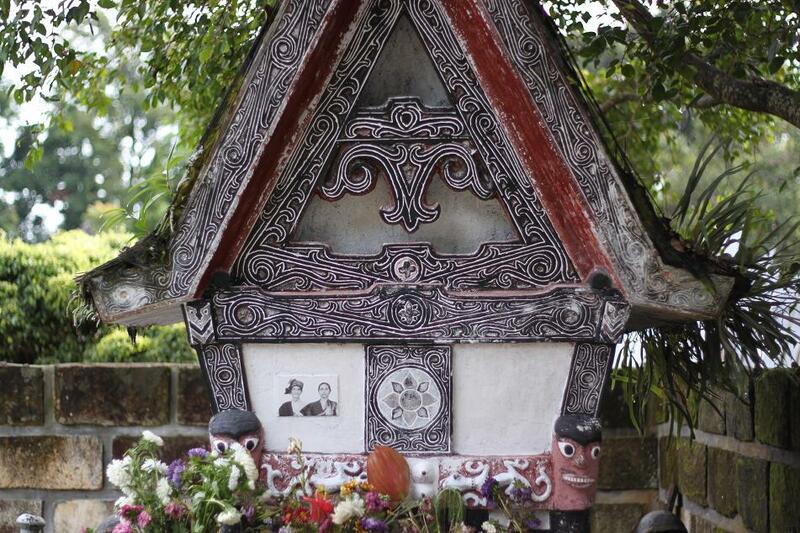 Probably the late settlement of Samosir was due to the nature of relationships among Batak tribes themselves. There was no such thing as trust, therefore they never left any path even to neighboring tribes, making any discovery to the interior of Sumatra even more difficult. But again, that’s just my theory. I need to do more research about it. The tombs looks very eerie to me. Never come across this before. Nevertheless, its the first for me. Thanks for sharing. Just don’t go there alone at night! 🙂 Thanks for dropping by! Interesting, and VERY nice photos! Pingback: The King, The Missionary and The Trial Stone « What an Amazing World! Pingback: Dance and Swing Until The Egg Breaks « What an Amazing World! Unfortunately I can’t find any story about the woman. Well, not yet. I’ll keep looking! Thank you for taking time to provide the history and stories of the places you have traveled! It’s educational and informative! For me one of the most exciting things about traveling is sharing the stories of the places I visited. Thanks again! Our Tour guide told us that the woman king fell in love – actually kept the cup without handles on her hear signifying her refusal to marry the king and reason was that – She had many secret lovers !!! What an intriguing story! She reminds me of Catherine the Great who also had many lovers. Thanks for the info!